Kelly Evans is one of the finest female journalists in the world today. Currently working as the co-anchor of the show Closing Bell, Evans worked in CNBC’s Europe London headquarters for a year before she moved to New Jersey. Evans is one of those celebrities you wouldn’t find anywhere on social media. Her departure from the social media was a big deal. Sometime in 2016, Kelly announced that she has deactivated her Twitter account. According to Kelly, deactivating her Twitter account severed an eight-year relationship that had become a big part of her professional and personal life. Nonetheless, the CNBC anchor pointed out that it was a step in the right direction. She said she felt lost in endless spools of social media. “…All the while emails by the thousands were piling up, phone calls were getting lost in the mix, and messages from the most important people in my life were getting drowned out in the din. I was more responsive to comments on Instagram than to my own closest friends and family. “I shut down social media because I needed to shut out online distractions and engage with the people, issues, and work right in front of me. I started reading the newspaper first thing daily instead of following the news all day on social media — and I’ve never felt better informed,” she explained. She deactivated her Facebook page and Instagram accounts the previous year. To her, it’s not cool for social media to enlarge our impersonal connections while it is bringing apart the closer, trickier, and more personal ones. Born on July 17, 1985, in Hartford, Connecticut, Kelly is a George Washington Honor scholar and a graduate of Washington and Lee University. It is known that she served as the co-captain of women’s lacrosse team during her college days. Prior to that, she earned eight letters in the same sports during her high school. Before Kelly Evans joined CNBC, she worked at the Wall Street Journal where she covered several topics on real estate and economics. Records of her deeds say she hosted the daily News Hub program on WSJ.com and, was a frequent guest on television and radio networks. She joined the Journal in 2007. After that, She worked as a reporter for the Global Economics Bureau and was a moderator for a 2012 Republican Primary debate. She also moderated James Carville v. Ann Coulter debate. These made her a popular name in the field of journalism. Kelly Evans joined CNBC in February 2012 as an on-air correspondent, reporting across CNBC’s Business Day programming. Before she became the co-anchor of Closing Bell, she was the co-anchor of the networks’ Squawk on the Street and Worldwide Exchange based in London. As common with most celebrities, Kelly Evans’ fans have always wanted to know the value of everything she owns. This has stirred several estimations of Kelly Evans’ financial status. Unfortunately, most of the estimates can’t be substantiated as they are all guesswork. This is also true with her salary. While it is common to find that Kelly Evans’ salary is $500 thousand, several different figures have also circulated as what she earns. Evans, who is often compared to Erin Burnett, currently has a net worth of $2 million. 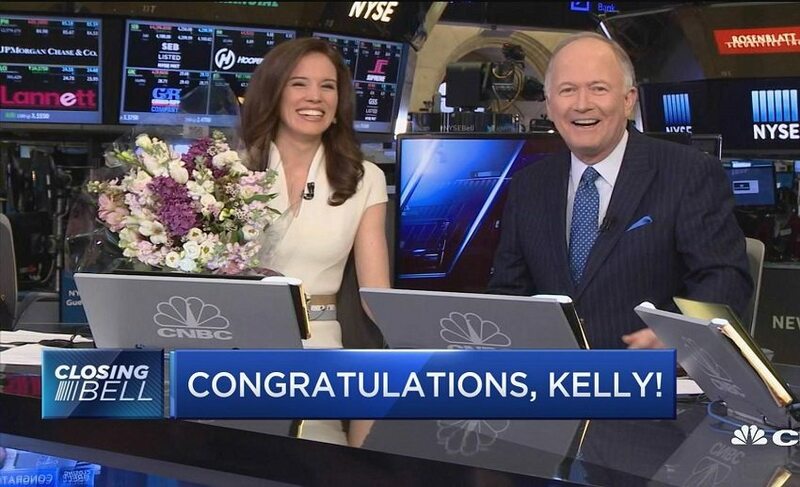 When Kelly was 27 and reporting for CNBC’s Squawk Box, She was named in Forbes’ 30 under 30 media list. The CNBC anchor is ten inches taller than five feet and has always been described with such words as “charming” and “attractive”. For this and other reasons, her fans have always been interested in knowing about her love life. Kelly on her part has consistently strived to keep things private. Speculations were being made about who she’s dating when it emerged that she’s getting married. As it happened, she received flowers from her CNBC colleagues on the 20th day of April ahead of her wedding on Saturday.